Bios - The Real People! Books To Read! No, Really! Joyeux Noel - WWI - NEW! Escape From Sobibor - NEW! Would You Have Made A Good Officer In The Trenches? The Third Wave - Fact or Fiction? One Day In September (2015) REVISED! 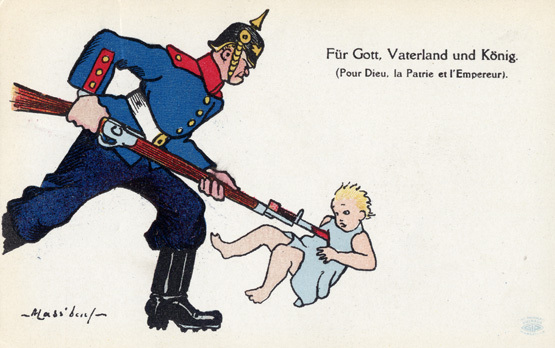 This German post-card expresses the idea that England was trying to takeover all of Europe - and that Germany was ready to stop ! 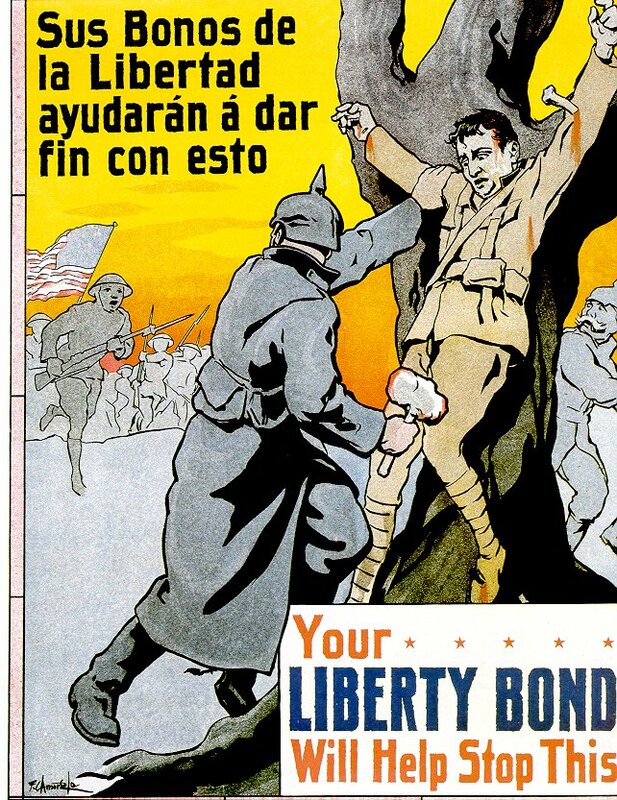 Most German propaganda was nationalistic - showing how Germany would kick the crap out of its enemies once a war started, The Germans did not produce the hateful propaganda that the British and Americans did. 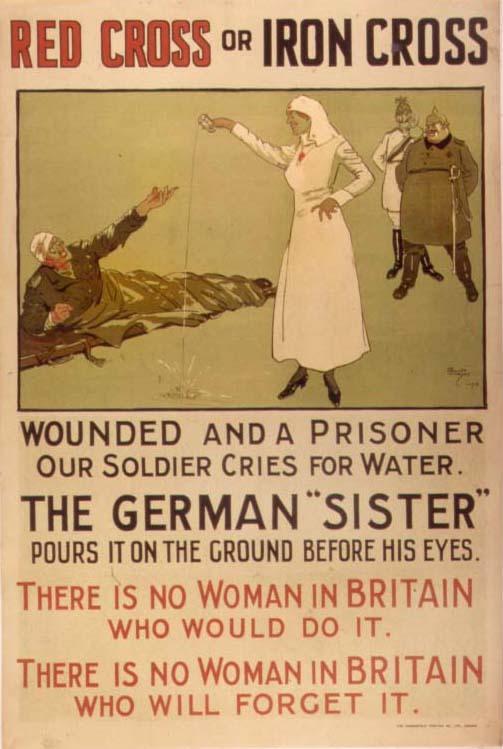 Many posters tried to make men feel like THEY were needed by their countries. Here's the famous American Uncle Same poster next to the British version that inspired it. The British poster came first! 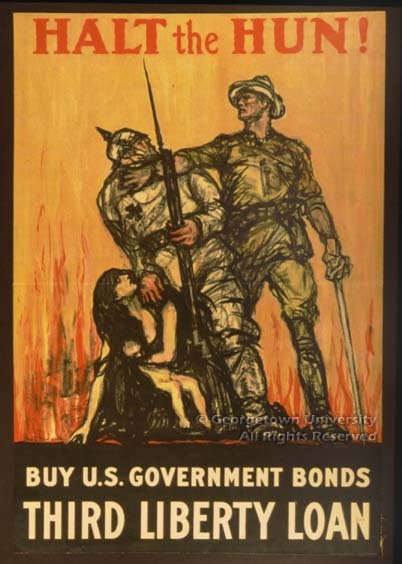 Alot of WWI propaganda was designed to make people in England and the U.S hate the Germans. The posters above show several examples of how the Germans were shown as monsters, barbarians (Huns) , and other scary things! 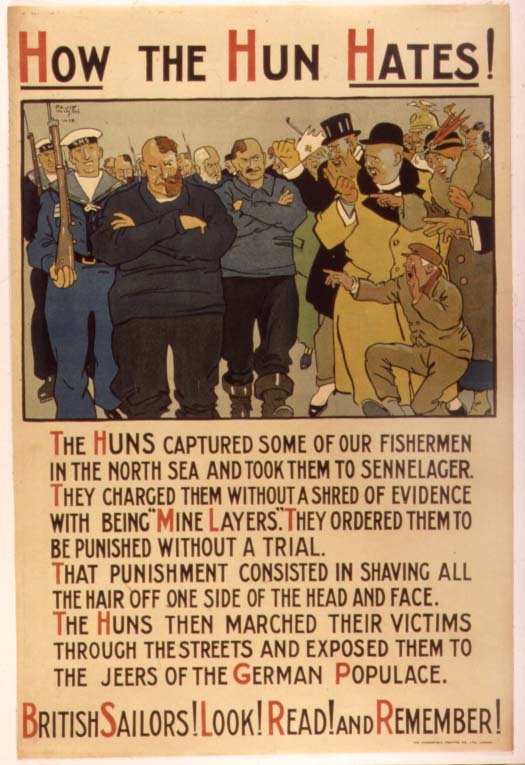 Above are two posters showing how particular stories/rumours of German atrocities were used to inspire men to join the fight. 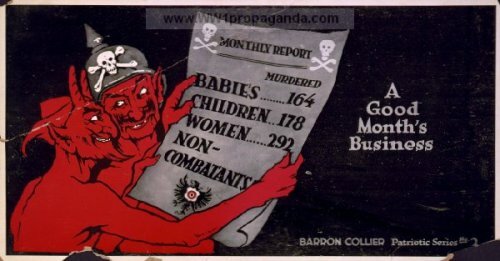 A popular WWI myth described how German soldiers killed babies and young children in Belgium and France with their bayonets. Again, such stories have never been confirmed, although the Germans did kill many innocent civilians in Belgium. One WWI propaganda story claimed that Germans crucified a Canadian soldier captured in the trenches. 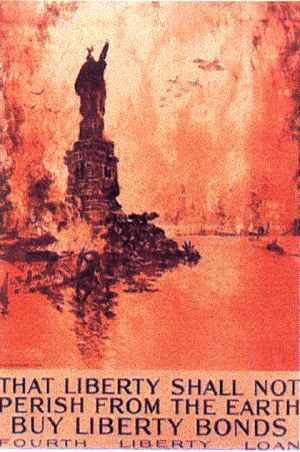 There is no proof that this ever happened, but the story was used in posters like this one to inspire hatred of the Germans. 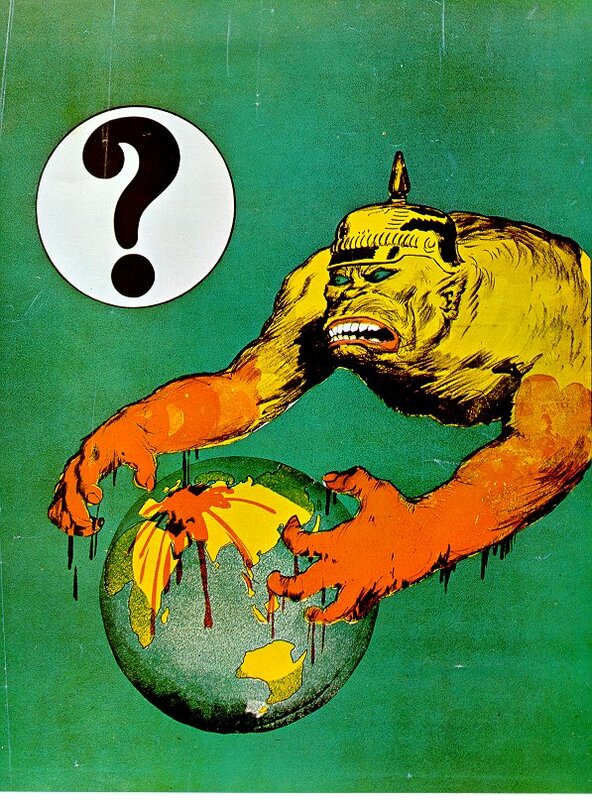 ABOVE: A variety of anti-German propaganda cartoons and posters from WWI. 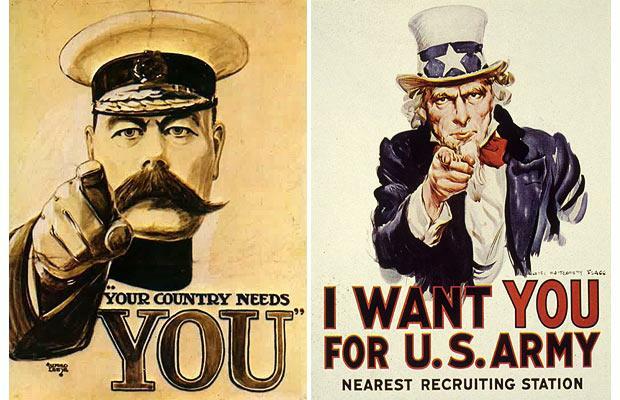 Here are two British posters used to "shame" men into joining the armed forces. 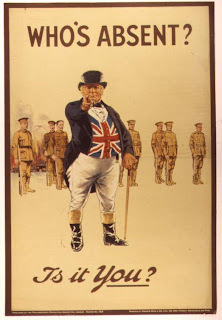 Posters like this one from England inspired young men to join the army. The posters above were based on German actions during the war and used to inspire people to support the war against Germany. 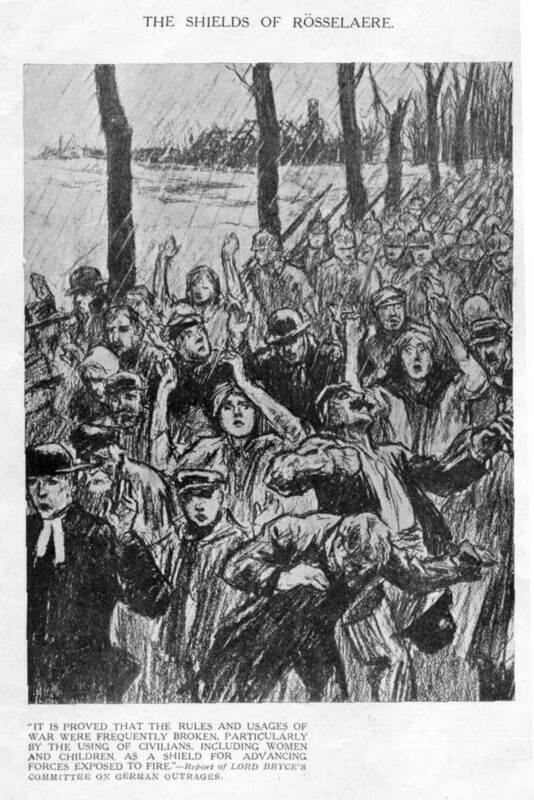 The German invasion of Belgium turned many Americans against Germany as did the sinking of the passenger ship Lusitania in 1915. A popular story told of how the German army placed civilians in front of their path - as a human shield against British rifle and artillery fire.